Kebabs come in all shapes and sizes. In the last KeBabMag we had a look at the new wave of Turkish and Middle Eastern kebabs in Brum. 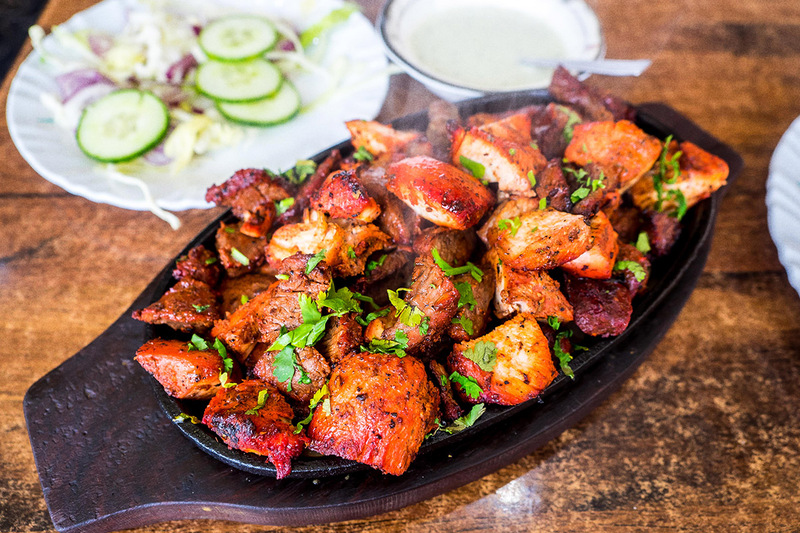 But really we were just skirting around what we do best in this town, the spice-laden kebabs of India and Pakistan. The bright reds of the Punjabi grill; from seekh to shish through tandoori and tikka. These are the flavours that Brummies and Beyond have grown up with. The shami kebab burger from Salt n Pepper in Digbeth at 2am, the mixed grill at The Avenue on Green Lane and the lamb chops at Lahore on Ladypool Rd. Every native knows these flavours, the deep penetration of spices, the extravagant seasoning of sometimes mystery “meat”. All have their favourites and to try to review every kebab in Brum would be a lifetimes work, a probable artery hardened short lifetime. Here are just a few of my highlights. I went to school on Grove Lane, way before this pub remodelled itself as a sports pub and grill. I remember sitting in this grotty corner pub back then, now there’s simply no better space in this city in which to watch Sky Sports and eat a Punjabi feast. Sounds niche? Not really, the place is packed with people on TV match days. Order the mixed grill (regular size £9 if there’s less than 4 of you), some side curries, masala fries and maybe some paratha. The menu is classic Birmingham curry house, no modern interpretations or anything too authentically regional. The food arrives fast, you order at one hatch, take a buzzer and collect it at the other hatch when called. 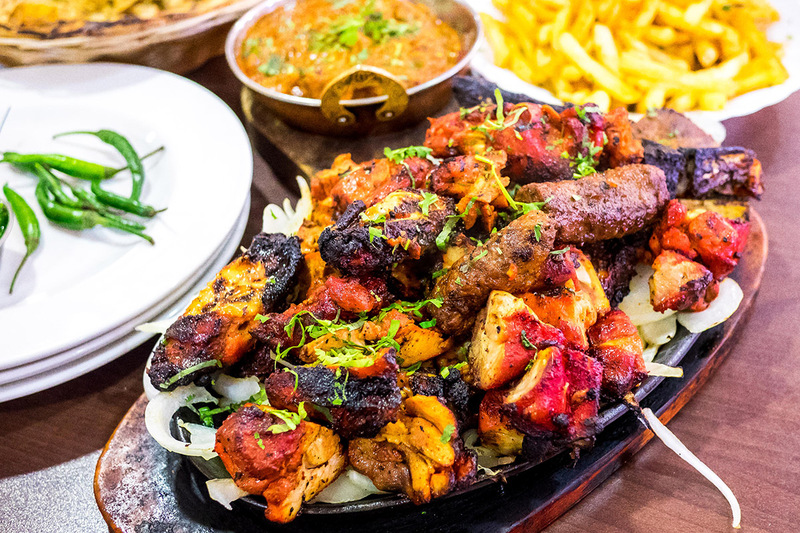 Your eyes boggle at the size of the regular mix grill served on a hotplate and sizzling on its bed of sliced onion. The best chicken tikka in town for sure and copious chicken wings. The lamb chops are fine but the sheek kebab is always a little disappointing. But that chicken tikka is worth the £9 on its own. Made from chicken thighs so they’re always tender and juicy. Don’t forget to pick up the green sauce at the hatch, it’s the perfect condiment for the grilled meats. The curries and daals are deep and sticky and the breads are great too. I find it hard to think past The Grove if I’m looking for good cheap South Asian eats, it’s always at the top of the list. Beer and curry. Curry and beer. The two go hand in hand don’t they? Well, it may be so but this old fashioned drinking culture has also set back the quality of Indian cuisine on our high streets. Tipu Sultan bucks that tradition and is totally dry of alcohol. Ironically it’s in the old Jug of Ale pub Moseley, Birmingham. Something magical has happened to that run down pub, famous for being the city’s best Indie gig venue back in the day (Nirvana played there), it’s now the most lavishly appointed restaurant this side of Dubai. Fit for Moghul emperors and just on the right side of bling. Tipu Sultan does not scrimp on flavour either. Grilled meats are slathered in spice pastes, but does not overwhelm the quality of the meat or the cooking. Their signature Sultani Chops leave your fingers stained and your taste buds singing. They are the best tandoori lamb or mutton chops in town. Deep flavours and tender meat. For £4.95 they’re a generous starter size and you will struggle to fit in a full main afterwards, you’ve been warned. A Ladypool Rd stalwart. Lahore fulfils all your balti needs but if you look at the menu a little more closely you’ll see authentic Pakistani dishes. A favourite with the locals, you can see them tucking into maghaz (lamb brain) and ojri (tripe). But if you’re feeling less brave go for the lamb chops or the mix grill. At peak times this place can be heaving, I usually call ahead to pick up on the way home. 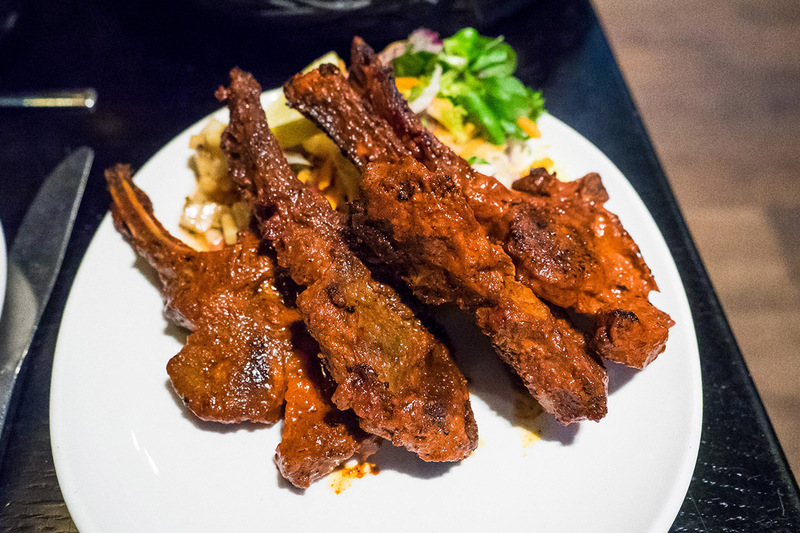 The chops are not as refined as those from Tipu Sultan, stringier and saltier but tasty all the same. The chicken tikka in the mixed grill is made from the chicken breast so a tendency to dryness and no chicken wings! But quite a generous portion for £9 that also includes naan bread. It’s not my top choice but Lahore is cheap, cheerful and reliable. Raja Monkey is a little different. From the same guys that run upmarket Lasan and Fiesta Del Asado, this small Indian Street food Café brings interesting regional dishes to the suburbs. In its thali set meals, you can venture from the north of the subcontinent with their Rajasthani mutton thali to the Southern Indian thali replete with sour fish Kari. Raja Monkey has an open kitchen at the front and watching the chefs prepare your food is pure theatre. They have nothing to hide here; from the dosa cook to the tandoor cook they all take great pride in their food. The Nawabi Kebab Thali is pricey at £14.79 and at first glance doesn’t seem as generous as what you’d get at The Grove or Lahore. It simply isn’t but the quality of the food speaks for itself. 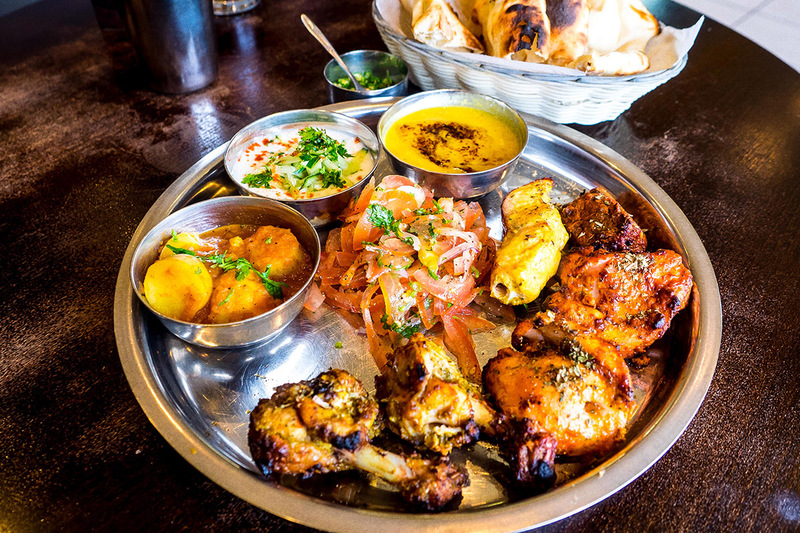 After eating the perfect naan bread, daal, aloo, salmon kebab, lamb shish, chicken tikka, chicken wings and salad you’ll realise it’s the complete meal. Knowing that Raja Monkey is there sometimes makes the motivation for cooking at home more difficult.